159 Commercial Real Estate & Properties in Morayfield are listed in 6 categories. We have 90 Retail ShopsLease , 42 OfficesLease , 18 Industrial Warehouses Lease , 6 ShowroomsLease , 5 Other Commercial PropertiesLease and 3 Development LandsLease . Ray White Commercial Northern Corridor Group is please to offer 23/70 86 Michael Avenue, Morayfield for Lease. 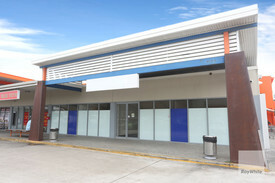 Features: 348m2 Retail tenancy located in busy complex in the heart of Morayfield. Current tenants include Drake IGA, Nandos, Health Central, CJ'S Pastries, Noodle Box and many more Large on site car park Pylon signage to passing traffic Air conditioned throughout High foot traffic site Motivated landlord Please contact agents Aaron Canavan or Chris Massie for more information or to book inspection. Ray White Commercial Northern Corridor Group are pleased to offer shop 12, 65 Morayfield Road for lease. Features: 303m2 Fully fit out restaurant site for lease Current fit out can stay or be removed Located fronting busy Morayfield Road Exposure to over 25,000 cars daily Market Plaza shopping centre is anchored by Woolworths Grease trap Brand new air conditioning throughout Transferable liquor licence Outside dining area For more information please contact the EXCLUSIVE agents Aaron Canavan or Chris Massie. Fully Fitted Out Restaurant Opportunity Contact Agent For Latest ..
Ray White Commercial Northern Corridor Group are please to offer 19A/70 86 Michael Avenue, Morayfield for Lease. FEATURES: 58m2 Retail tenancy with shop front Stainless steel sinks wash down area Air conditioned throughout Large on site car park High foot traffic area Neighbouring tenants include Drakes IGA, Nandos, CJ's Bakery, Health Central many more For further information or to arrange an inspection, contact Aaron Canavan or Chris Massie. 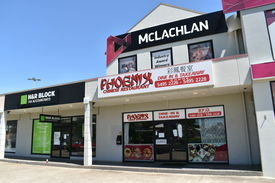 Fully Fitted Out Bakery Contact Agent For Latest ..
Suit Small Retailer - Busy Centre Morayfield $3000 pcm inc gst and out..
Cheap Warehouse With 6 Roller Doors PRICE SLASHED $4,600 pcm ..
Central Morayfield Retail Showroom $7,920 pcm inc GST & ..
860m2 approx. freestanding showroom/workshop Comprising of 500m2 high bay covered work space 360m2 showroom/retail space High bay lighting Open plan Oil separator Air conditioned retail area Toilet amenities Kitchenette 310m2 concrete hardstand Fully fenced gated site Located at entrance to McDonald's 21 car parks Call The Commercial Guys today to book your inspection or for further information. Unless otherwise stated, the price/property may be subject to GST and/or outgoings. 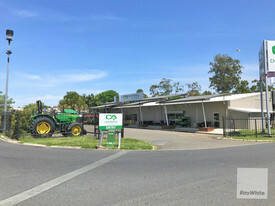 Ray White Commercial Northern Corridor Group are pleased to offer Shop 1, 65 Morayfield Road, Morayfield for lease. 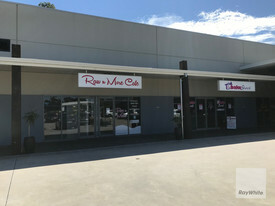 85m2 Retail space, currently fit out as bakery Located in Busy Woolworths Market Plaza Internal equipment including stainless steel preparation benches, counter, display fridge, exhaust canopy and more Join Neighbouring Tenants Indian Brothers, Fasta Pasta and Anchor Tenant Woolworths Signage Opportunity to Morayfield Road Ample on site Parking On site Amenities Incentives on offer For further information or to book an inspection please contact Aaron Canavan or Chris Massie. 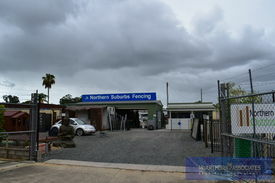 Fully Fenced Display Yard Plus Shed And Separate Office In Morayfield $3,750 per month includin..